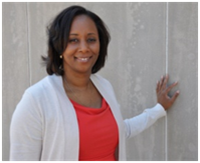 Please welcome Michelle Williams, a 4th grade teacher from Texas. Today she shares a super helpful idea to help students attack large numbers much in the same way they would attack large words. Thanks for sharing Michelle! When students learn how to read, they begin to read words with CVC patterns, but as they encounter more words, they soon realize that as words get larger, some words have vowel pairs, digraphs, and diphthongs. These words require a different word attack strategy than words with the CVC patterns. Swoop and group is a word attack strategy that teaches students how to analyze a word: Mentally swoop the letters in the vowel pair, digraph, or diphthong in the word, and then group them together before sounding out the word. 1. The students identify the first letter of the vowel pair, diphthong, or digraph, swoop underneath the letters, and then stop at the last letter in the group. 2. Group the letters together and determine what sound the letters make together. Students begin to master vowel pairs, diphthongs and digraphs in 2nd grade, while in mathematics they also begin to read three-digit numbers. 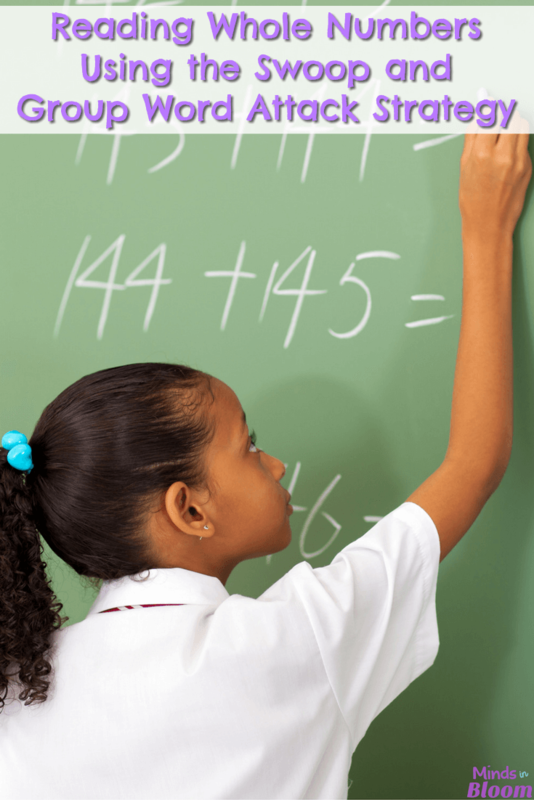 By the end of 4th grade, students should be proficient in reading seven-digit whole numbers; however, many 4th graders who are not proficient with decoding multisyllabic words are unable to read seven-digit numbers. The swoop and group word attack strategy provides non-proficient readers with a strategy for reading words and whole numbers. Reading whole numbers is much like reading words with vowel pairs, diphthongs, and digraphs, but the only difference is that numbers are being read. A digit that is in a place that has “ten” in its name is treated as vowel pairs, diphthongs, or digraphs and are swooped and grouped with the number in the ones, thousands, and millions place and read together. When numbers are changed from standard form to word form, you will notice that the swoop and group numbers are usually written with a hyphen. As with reading there is an exception to every rule: Hyphens are only used when the digit is greater than two in the tens, ten thousand, and ten million place. This is an important detail that you should make note of because two-digit numbers that are smaller than twenty are written as a single word. 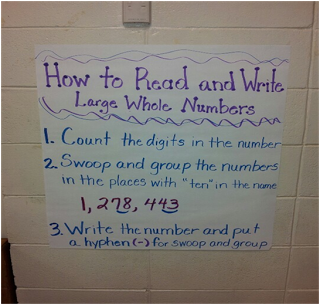 The anchor chart below shows the steps for applying the swoop and group strategy to a seven-digit number in standard form and converting the number to the written form. The students count the digits in the number using place value. This helps them to concentrate on the digits that are in the place with “ten” in its name. Some students will need to label the places, while others will only need to say the digit’s place and then swoop and group the digits. After swooping and grouping the digits, the student will then determine if a hyphen is needed or if the digits will be written as single word. When I introduce reading numbers, I begin with three-digit numbers and then increase the number by one place value, after the students have mastered reading the previous numbers, until I reach a six-digit number. When the students are reading large whole numbers in class during an activity and they read a number incorrectly I ask them, “What two numbers do you have to swoop and group?” As with reading they will analyze the number and then self-correct and then re-read the number correctly. I have been an educator in Texas and Louisiana for 14 years. I most recently returned to classroom to teach 4th grade mathematics after serving as an Instructional Coach for two years at a middle school. I love to integrate literacy strategies in mathematics because it gives my students additional support in reading and increases their literacy in mathematics. Please visit me at my Teachers Pay Teachers Store.